Outgrown School Shoes Find New Feet And Build Brighter Futures. As most of us know, the cost of school shoes can be quite frankly outrageous and (as our children often grow faster than they can wear out their shoes) each year, all over the UK, perfectly good school shoes are simply being discarded, replaced by the next size up. Would it surprise you to learn, however, that there are many children around the world who are being denied access to an education, simply because their families cannot afford the requisite school shoes? There are, in fact, an estimated 300 million children worldwide for whom walking with shoes is a rarity. Two big problems: one of waste and one of need, are both being solved by children’s charity Sal’s Shoes and its Toe to Toe campaign, which aims to coordinate the wide scale donation of pre-loved school shoes from schools around the UK to those globally who otherwise cannot access an education. When we stop to think about the number of good quality school shoes that are outgrown, but not outworn, each term here in the UK, the waste is staggering. Now, entering its fourth year, the Toe to Toe campaign has seen more than 650 schools worldwide participate. On the last day of the academic year, pupils turn in their own school shoes that they are likely to outgrow over the long school holidays and donate them to change the lives and shape the futures of other children, by gifting them an education. There is a direct correlation between education and poverty: education can mean a way out of poverty in many countries but, although the education system is free to access, school uniform is often mandatory. Without school shoes, many children are simply not permitted to attend school and so, often, levels of poverty deny them access to an education and the opportunities it affords: perpetuating the cycle of poverty within communities. It’s an unsettling thought when we live in such a disposable society. The thing that we love most about the work that Sal’s Shoes does, is that every pair of shoes that is donated can be tracked, and so children can follow the path of their former shoes all the way to their new owners, often receiving photos from thousands of miles away. Similarly, each donating school receives details of the new feet that their shoes have found, so pupils can hear first-hand how their generosity has changed the lives of other children. For example, five young boys in Nicaragua (aged between 9-12 years old) had spent their lives picking coffee in the fields for $1.31 a day. Thanks to donations from school kids in the UK, they now have the required shoes on their feet to be able to go to school and create a brighter future for themselves, proving that the simple act of donating outgrown shoes can literally transform lives. The school will need to confirm its participation in Toe to Toe 2019 and the deadline to do so is Friday 31 May 2019. The information pack is available on the website and, having read it and understood the commitment required, the school representative should email Toe2Toe@salsshoes.com with the school’s name, postal address and the number of pupils by this date, to ensure registration. Now in its fourth year, the Toe to Toe campaign has gone from strength to strength. When it launched at the end of the 2016 academic year, the children from just one primary school placed their shoes on their desks on the last day of term and left the school barefoot, to start the summer holiday. The following year, in summer 2017, over 600 schools took part and the charity received over 175,000 pairs of donated school shoes as a result! It continues to grow, year on year, and the more schools that sign up, the more shoes can be delivered to children who need them, enabling the charity to make an even bigger difference to young lives, more quickly. Sal’s Shoes was founded in November 2013, by mum CJ Bowry who wanted to send her young son Sal’s barely worn, but outgrown, shoes to children who needed them. Unable to find an organisation that could tell her where exactly Sal’s pre-loved shoes would end up, she decided to send them abroad herself. In its first year, the charity collected and distributed 4,805 pairs of barely worn children’s shoes and found them new feet in eight countries. 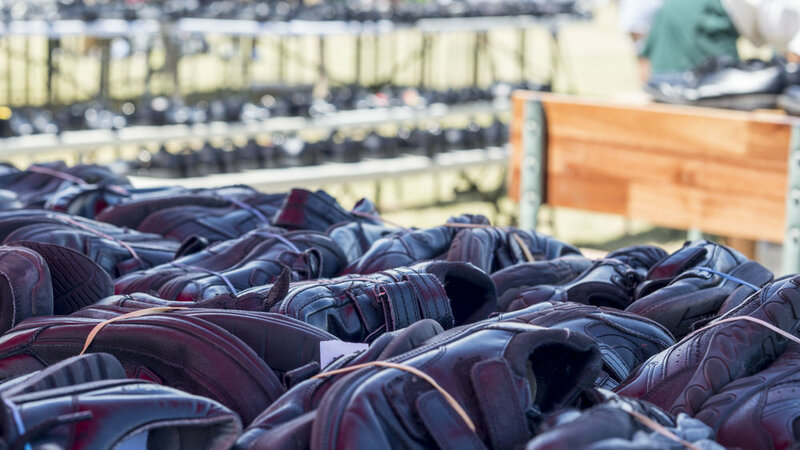 In October 2018, just weeks before its fifth birthday, the charity counted its 1,000,000th pair of shoes, having distributed donations in 38 countries worldwide, including within the UK. As a small charity, its principle limitation in continuing to help children worldwide is financial. Sal’s Shoes is only able to achieve what it does because so many people support its journey and offer help along the way. In order to help fund the continued distribution of donated shoes, the charity asks for a minimum of £1 donation per pair of shoes. How this money is raised is completely down to personal choice. Some schools have held Bake Sales, others Mufti Days or sponsored events, but the options are endless and can be a brilliant way for the children to feel even more involved with the charity. Sal’s Shoes welcomes all donations of pre-loved school shoes from around the UK but is also proud to work with some big footwear brands, including Treads, who donate £1 to the charity for every pair of shoes purchased and offer a 10% discount with the code SALSSHOES1. Sal’s Shoes is a Registered Charity in England & Wales.